Sundance 2015's breakout hit, Robert Eggers' “New England Folk Tale” The Witch is nearing theater release and building anticipation with some insidiously terrifying trailers, each more sinister than the last. This dark and unassuming film should appeal to devoted horror fans with the familiar theme of pitching God fearing colonial life against satanic witchcraft, but also a larger audience thanks to its positive critical reception and Sundance Best Director award. A24 have just released their third trailer for the film, 'Peek A Boo' (shown above), teasing anticipation by delving a little further into the source of the malevolent, baby snatching evil in the woods. The Witch is Eggers debut feature film -the talented director coming from a background of theater and short films before his Sundance success. The movie stars newcomer Anya Taylor-Joy as the historical family's eldest daughter, who is soon accused of witchcraft when malefic occurrences begin to plague the settlers. Her puritanical parents are played by Kate Dickie (Game Of Thrones) and Ralph Ineson (Kingsman: The Secret Service). 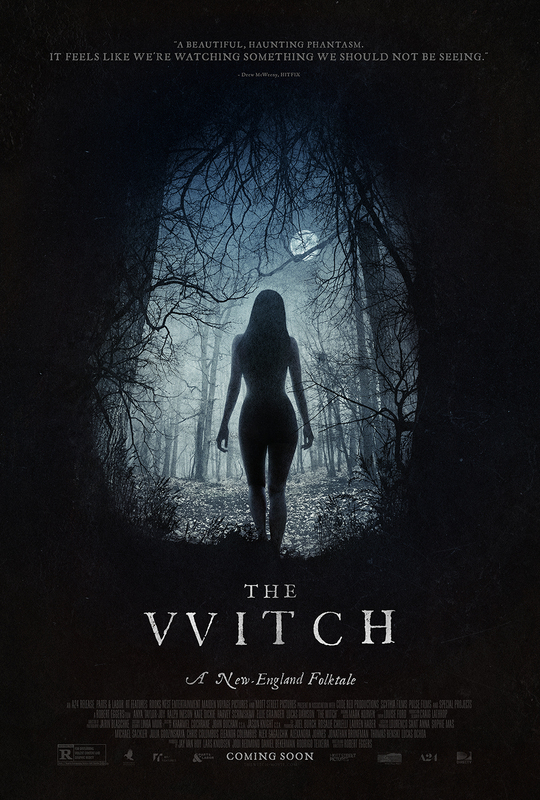 Previously released Witch trailers have slowly built the tension using a stark but relentless soundtrack that mimics a heartbeat, evasive clips that draw the viewer into the same state of paranoia and isolation that the characters experience and very little dialogue to keep audiences guessing about the impending threat. From the footage seen, Taylor-Joy provides the most human element - her parents and siblings mostly shown uttering quotable snatches from their staring, traumatized faces, such as “There's evil in the woods." Whereas the second trailer focused on the family's demonic black goat, Black Philip (a definite nod to satanic symbolism), the possession of another of the family's children and the disappearing baby in this new trailer takes the audience beyond the treeline into the witch's domain. Trailers often tread a fine line between gaining enough interest for the featured movie through advertising and revealing so much of the action that the moviegoer's suspense is damaged by the time the film reaches theaters. Due to the added boost from Sundance and the smart editing decisions, The Witch has been able to maintain a good level of mystery and intrigue three trailers later, without selling its artsy soul to the devil of marketing. From the action we have seen, common symbols of this horror sub-genre are used subtly enough to be highly effective - along with the bleak colors of the landscape and compelling performances of both the adult and child actors. When The Witch reaches theaters in mid-February, the signs are promising that this movie should deliver a disturbing and cleverly psychological dose of fear to an audience that has been expertly prepared by its potent marketing scheme - with very little blood spilled.... yet. The Witch opens in U.S. theaters on February 19th, 2016.